The first volume was brilliant and I believe it’s gonna be even more awesome this time around. Seven Collar T-shirt was one of the performers at AloudAsia Vol. 1. If you’ve always wanted to discover or enjoy and support local music then head on down to Bentley Music Auditorium (Mutiara Damansara, Petaling Jaya) this Saturday for the second volume of Aloud Asia. There will be live performances by Altimet, Paperplane Pursuit, Beathesystem, Angie Lym, Eliza Thomas, Bohemian and headlined by award-winning local rock band Estranged. The price for admission per person will be RM30 and half the price for students. There is also a special 15% discount to be given to Borders Rewards Card members. UPDATE EDIT: This event has passed. Please go here to read about it. 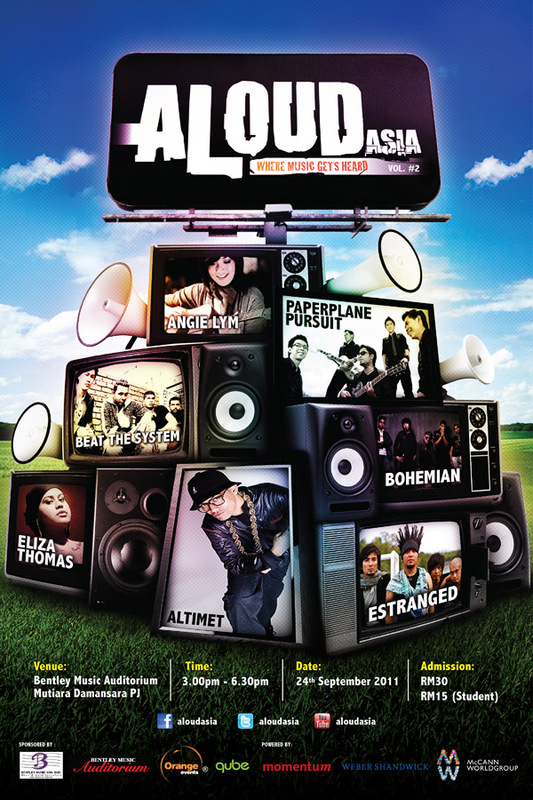 Petaling Jaya, 18 August, 2011 – AloudAsia is a music platform conceptualized by Momentum, the engagement arm of McCann WorldGroup, for established, upcoming and undiscovered Malaysian musical acts. These bi-monthly showcase of performances provide musicians a platform to introduce and have their talents heard. Through this vibrant and youthful musical platform, Momentum hopes to elevate the position of Malaysian music. “Music is a marketing currency and AloudAsia enables McCann Worldgroup to consistently engage and connect with the youth of today through a medium which they are comfortable expressing themselves in. This platform will give us invaluable insights into youth trends and lifestyle indicators”, commented Head of Momentum, Andrew Pinto. The AloudAsia stage features the latest musical equipment and sound and light equipment provided by Bentley Music and Orange Events. With Marshall Guitar amplifiers, SWR bass amplifiers, along with Pearl drum set and Zildjian cymbals, AloudAsia equips musicians with the full rock star experience from high-quality equipment to the screams and cheers from adoring fans. 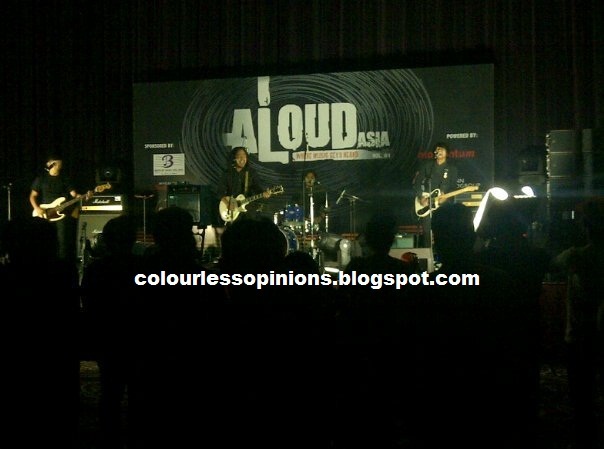 “Aloud Asia exposes undiscovered and upcoming musical talent which we have in Malaysia. Regardless of genre, background or ethnicity, musicians want their voices heard and their music recognised. AloudAsia is the place for these musicians. Here they are able to express themselves and showcase their talent for everyone to witness. Who knows, the next ‘Justin Beiber phenomena’ could be a Malaysian artist”, adds Pinto. In addition, AloudAsia will eventually also look to conduct mentoring programs, for budding talents to learn from established musical artist. Furthermore there will be plans to partner with NGO’s or charitable organizations to raise funds and awareness as part of their program to give back to society. On a larger scale, currently in the pipelines are plans to organize a festival comprising of various acts and genres from previous volumes, once they have completed 12 volumes. Having completed their first volume in June 2011, the much anticipated next volume is scheduled to take place on Saturday September 24. Performing artists such as Estranged, Altimet, Paperplane Pursuit, Beathesystem, Angie Lym, Eliza Thomas and Bohemian will be featured at the upcoming Aloud Asia. Also K-town Clan will be launching their new album supported by Aloud Asia. The launch will happen immediately after the volume from 8-10pm.